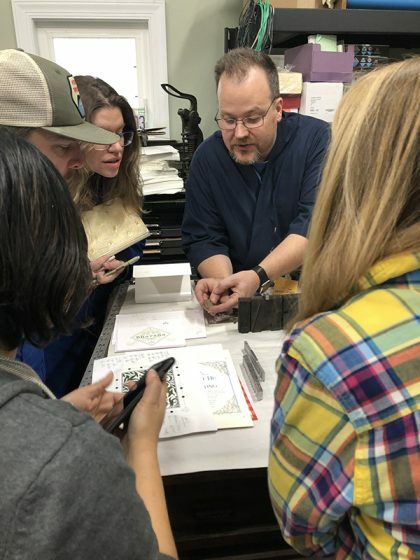 Chris Paul, of North Carolina-based Old North State Press, shares with us how an evening introductory printing class flourished into a love for printing machines and letterpress. From there, with the help of numerous, generous mentors and his wife/partner, Danielle, he has immersed himself happily in the craft. Read on to discover how Chris passes on the knowledge he’s learned with the letterpress community. 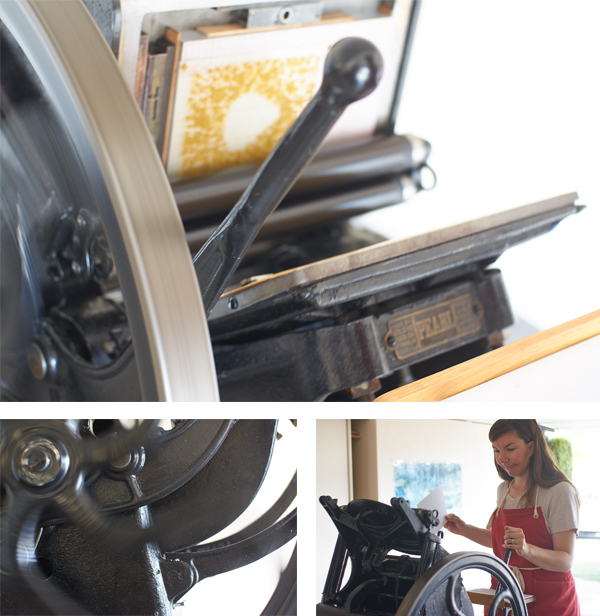 At Old North State Press, we are dedicated to preserving the tradition and craft of fine letterpress printing. We started our journey with the acquisition of a simple cylinder press in 1998. The studio now boasts an impressive array of heavy, outdated machines and equally obsolete related equipment, all meticulously maintained and loved. 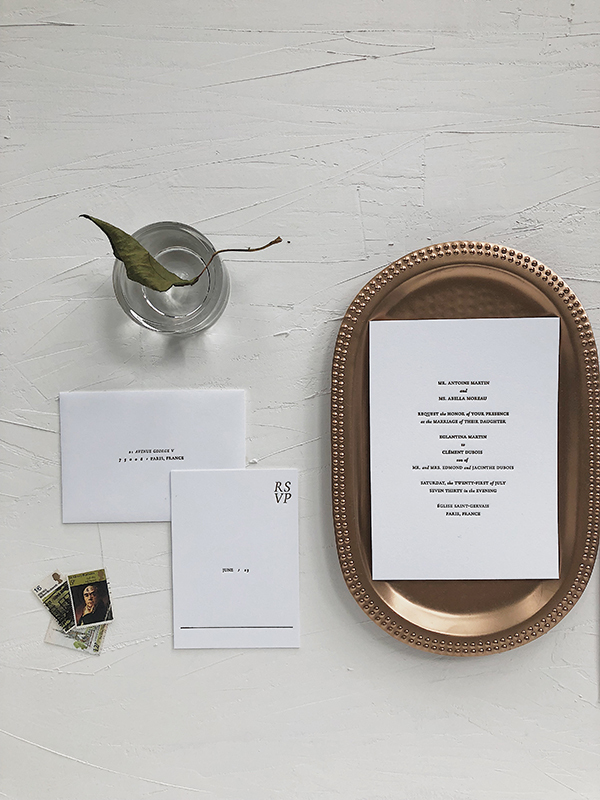 In addition to supporting custom client work where the unique characteristics of letterpress printing is desired, the press produces original designs for stationery, note cards, wedding invitations, birth announcements, broadsides, and other printed matter. 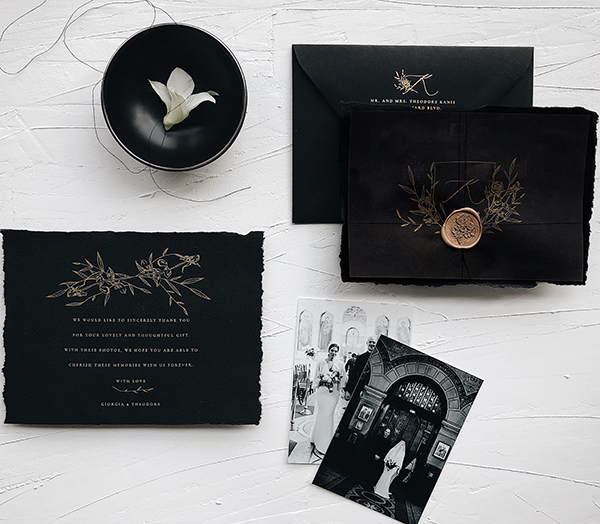 I am a classically-trained designer and typographer and completed my MFA in Design at Yale School of Art in 1995 where I was first introduced to traditional printing methods. I enjoy fretting over the details and coaxing beauty from these iron beasts. My wife and partner, Danielle, is a fearless editor and etiquette expert. She has a Masters in Communication. This background comes in quite handy with our clients and the work they bring us. 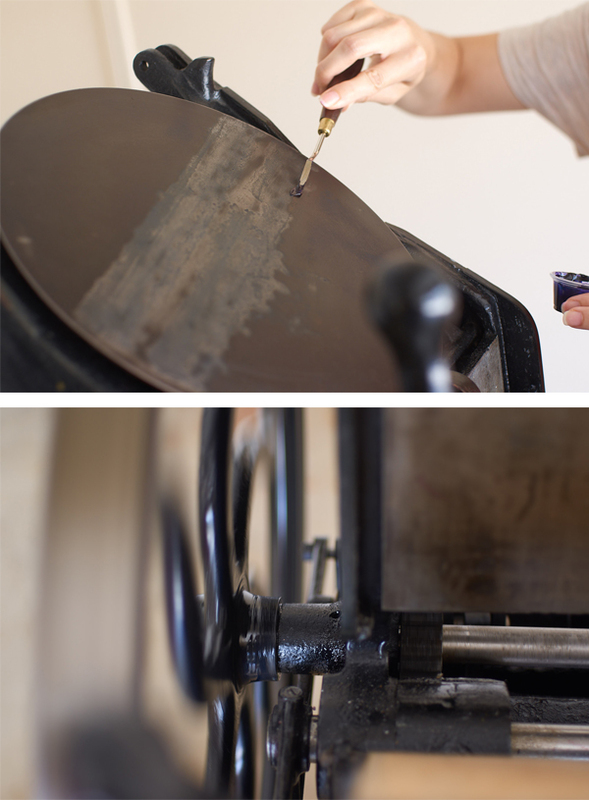 Danielle has a keen eye for fine presswork and ensures every piece we produce measures up to our exacting standards. Back in the early 90s, while in grad school, a few of us signed up for introductory printing classes, taught once a week on Thursday evenings, at the university printing facilities. The start of the digital era in design was in high gear and while many of us had been working in print for some time, our understanding of the tradition and craft of printing was limited. 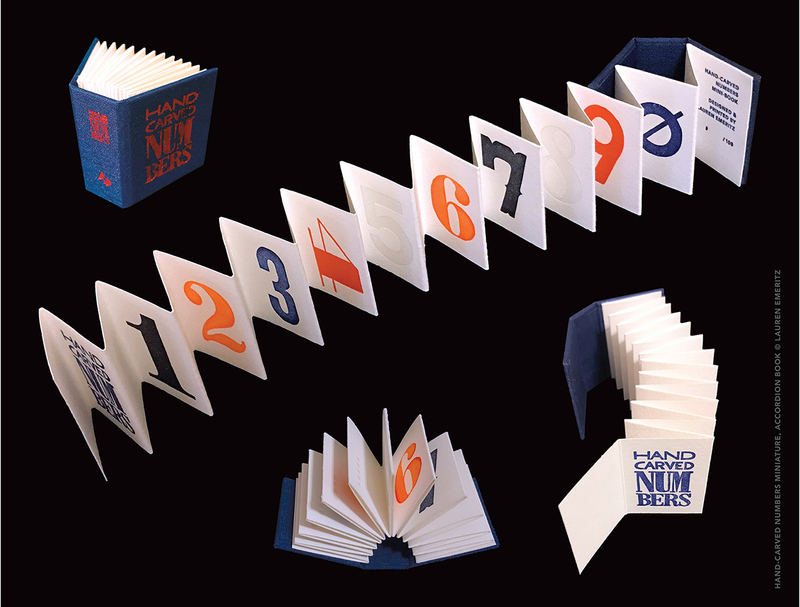 I had only seen pictures of metal type in books. Greer Allen, the former University Printer at Yale and one of the instructors, would regularly shake his head at how little we knew! He was, however, a truly patient and enthusiastic teacher. 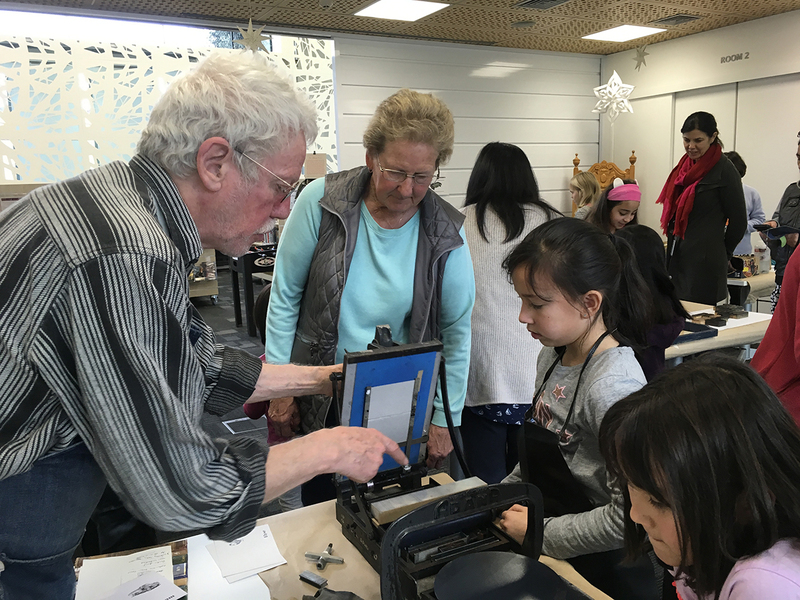 In the class, Greer and a local book designer, Howard Gralla, taught us how to set type by hand and print our simple creations on a Vandercook proof press. I was hooked immediately. The exquisite mechanics. The rich history. The endless possibilities. 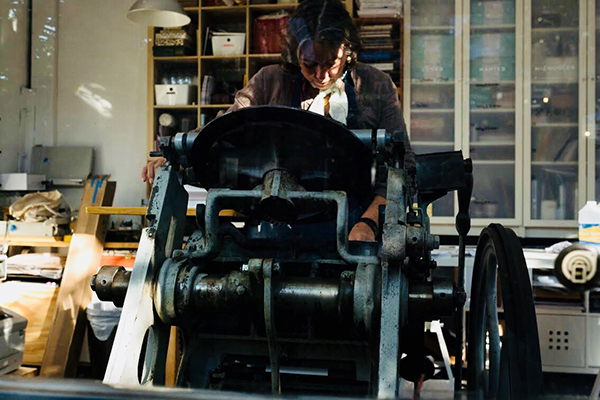 I vowed then and there I would learn as much as I could about letterpress and, one day, find a press of my own. I got a job doing design at IBM in 1995. In 1998, Danielle and I moved into our first house. It had a garage and thus, room for a press. 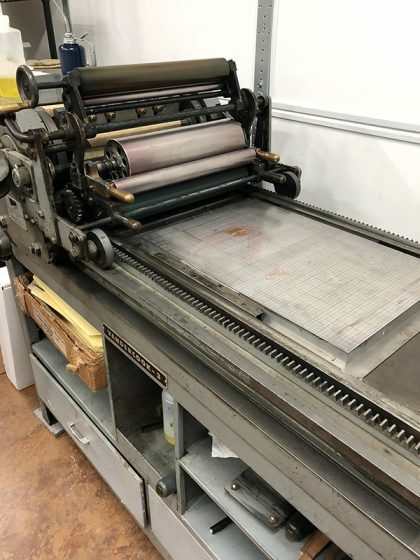 We acquired our first press, a Vandercook No. 3, soon after moving in. Because I work in software design, I tend to think of everything as versions. We’re currently on version 3.0 of our shop which we built in 2014 after moving to the Charlotte, NC area. Our shop is about 400 sq ft and houses all of our equipment. We still have the original Vandercook No. 3 but have since added two late model 10×15 Heidelbergs. The first Heidelberg was re-built from the ground up by Graeme Smith while he was with Whittenburg in TN. It is a beauty and our most prized piece of equipment. The second Heidelberg was acquired this past summer and is in need of a good cleaning and some serious TLC. Our intent is to dedicate this second machine to foil and die-cutting. Because of my desire to learn everything I could about traditional letterpress, I also got into hot metal typecasting in the early 2000s. With the help of some amazing mentors, I was able to acquire an English and American Thompson Sorts Casters and a small library of matrices. I first learned to cast type under the thoughtful tutelage of Pat Taylor, former proprietor of Out of Sorts Type Foundry, and Rick Newell formerly of Heritage Printers in Charlotte. We also have many cases of metal and wood type, an antique John Jacques & Son paper cutter,and all the various accoutrements you’d expect in a working shop. What we love most about our shop is having a dedicated, climate controlled space to design, make and learn. 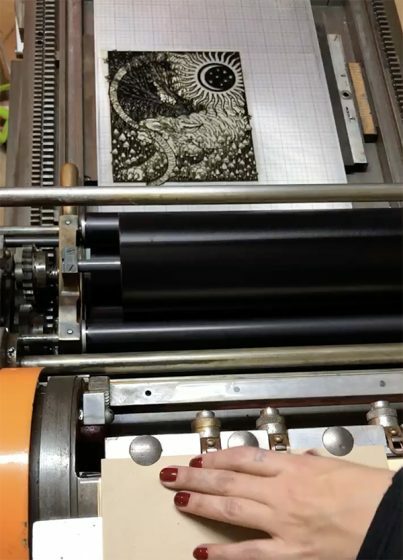 Letterpress has a deep heritage, and these machines teach us something new every time we use them. Our shop is located on our property in an older, heavily wooded and secluded neighborhood south of Charlotte, NC surrounded by horse farms. We are 10 minutes from historic downtown Waxhaw and 30 minutes from Uptown Charlotte. I am deeply indebted to many for the generosity of their time, patience and wisdom. I first learned to print from Howard Gralla and Greer Allen while a grad student at the Yale School of Art. Rick Newell helped me acquire my first press and type, and he taught me what it means to run a shop. Pat Taylor, Rich Hopkins, Mike Anderson, and Jim Walczak inspired me to give typecasting a go and encouraged me to keep at it. Fritz Klinke of NA Graphics took me under his wing early on and instilled within me a love of the process, hot metal type, and the journey of “figuring it out.” Elias Roustom of EM Letterpress taught me more than a few tricks of the trade along the way and his work continues to inspire me. Further, where would any modern day letterpress printer be with a reliable rigger? Pete McFee has moved every press I’ve ever owned and introduced me to electricians and repair techs who know and appreciate these old machines. Priceless! I’m also indebted to and inspired by the many designers, printers, and clients I’ve met along the way who have shared hints, tips and techniques and pushed me to learn and make. Last but not least, sincere thanks to my partner, Danielle, who has taken this journey with me, providing support and encouragement at every step. I am not yet a full-time printer, however, I spend as much time as I can in the shop and am fortunate to have clients who keep coming back and pushing me to learn new things. I suspect one day I’ll be doing more printing than not, but we’re still a few years off from that goal. By day, I work in technology, designing digital experiences and products. Thus, my design process for letterpress can seem to be a bit fragmented. Sometimes, an idea occurs to me and I have to get it out as quickly as possible. Other times, a fragment of an idea may sit in my head, stewing, for a few weeks/months before I act on it. 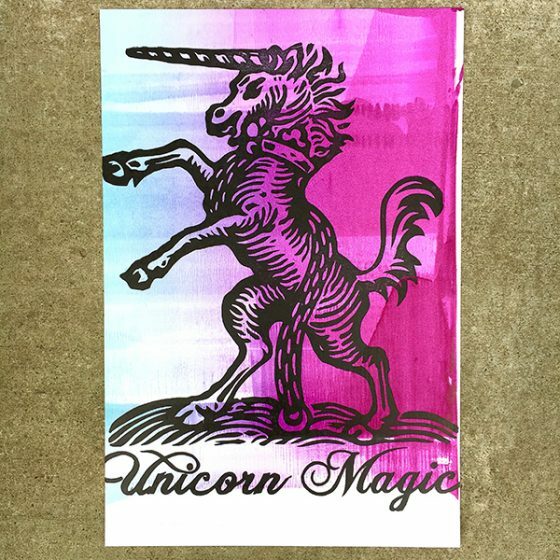 Occasionally, I will start with a technique I want to learn…like die-cutting or foil stamping and create from there. While I end up sketching quite a bit in the late process, my early iterations are almost always via writing. My sketchbooks have more words than drawings. I have an old t-shirt from Emigre with the slogan “Design Is A Good Idea” and this embodies how I approach what I do. Once I think I have something, I’ll sketch around the idea and poke at it multiple times before attempting to start something digitally. There is so much great work out there, you never have to go too far for inspiration…old and new. I’ve been a member of the American Typecasting Fellowship for over 15 years and am a graduate of Monotype University, both run by the amazing Rich Hopkins. 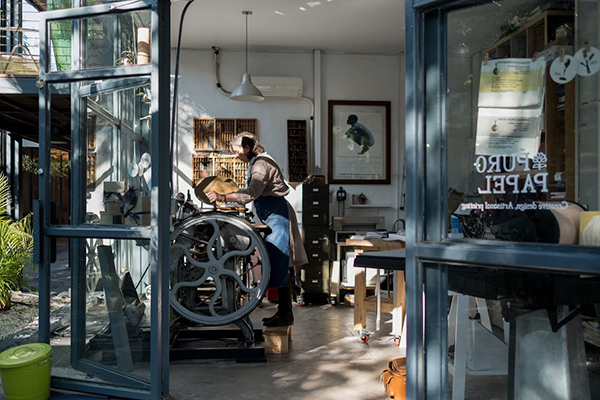 Our shop was one of 15 that Rich choose to feature in the book, The Private Typecasters, hand-printed and bound by Henry Morris at Bird & Bull Press. 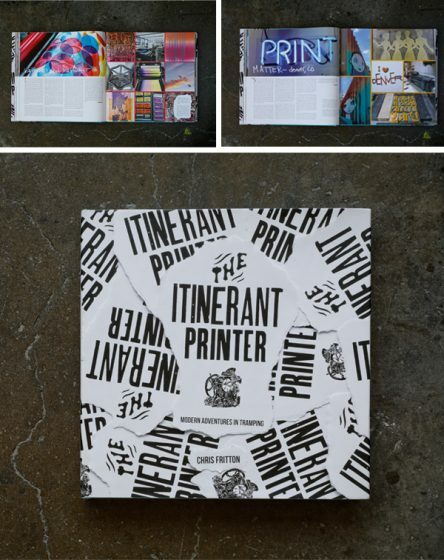 We’re also featured in the book, Vandercook 100. Most of all, we are proud of our ability to continue to learn, make beautiful things and share what we know with others. Our first press was Vandercook No. 3 Proof Press, acquired from the Charlotte Composition Company with help from friend and mentor, Rick Newell. I won’t tell you how little I paid for it, but I will say they almost paid me to haul it away. I love that press because it is so simple. One of our first real print jobs on the Vandy was the birth announcement for our son, Aidan. We did the same when Erin came along in 2003. In 2017, we printed Aidan’s high school graduation announcement on our Heidelberg. 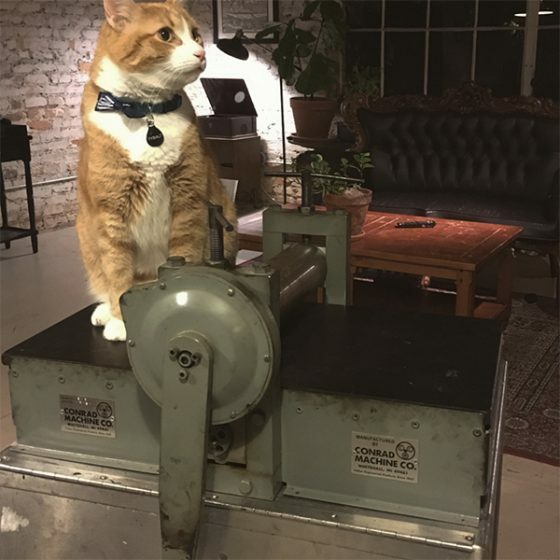 Boxcar has been an inspiration from the beginning: I distinctly remember my first encounter with Boxcar and how elated I felt that someone was actually running a successful business doing letterpress! I then invested in the Boxcar Base and haven’t looked back. I use Boxcar Bases on each press I own and Boxcar processes all my photopolymer plates. What I love most about Boxcar are two things: One, Harold Kyle and the team have continued to innovate from the very beginning…helping to modernize letterpress and make it relevant for today. The Boxcar Base and Swing-Away Lay Gauge are two prime examples. Second, the team at Boxcar shares everything they know and have helped me be a better printer. I’ve not found anyone more dedicated to the current community of designers and printers. Perhaps a useful letterpress printing technique? If you’re just starting out with a press like a Heidelberg, focus first on mastering the paper feed. There are so many nuances to feeding and once you master it, your life with be less frustrating and your printing faster and more satisfying. Read everything you can get your hands on about technique and setup and don’t be afraid to fail. Successfully printing on these old machines can be challenging. The most important piece is to keep at it. It takes time and experience to encounter the various challenges that will present themselves. When they do, step back and think. Frustration, failure and disappointment are how we learn. 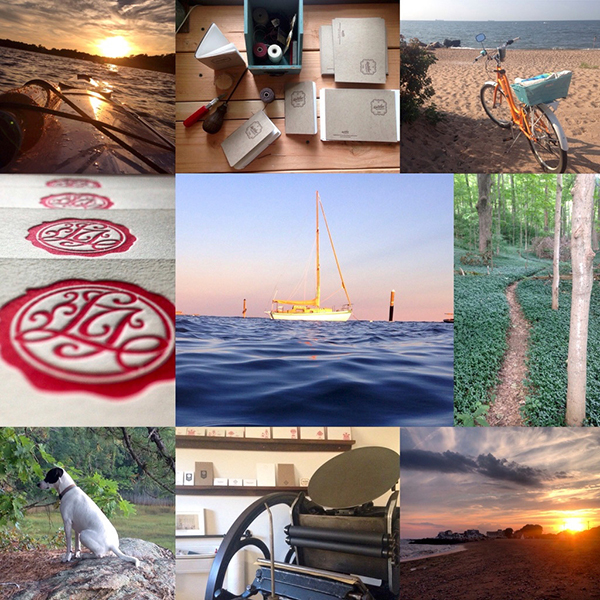 I founded the Facebook Letterpress Group in 2007, and we are currently 4500+ members strong. Included in the group are both active and many retired printers with great experience and know-how. I turn to the group regularly when I encounter something I haven’t yet figured out. 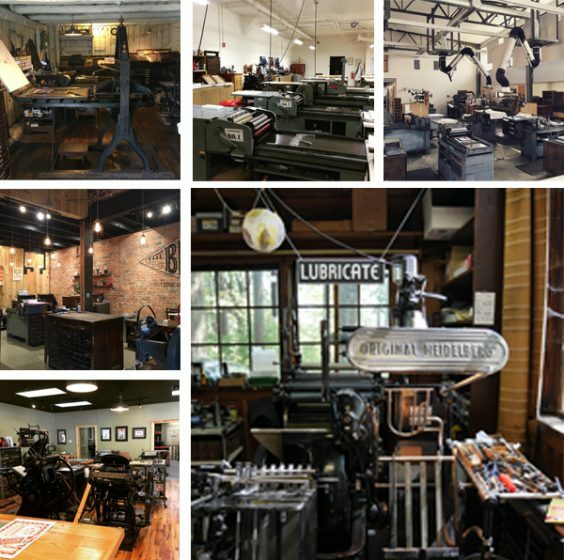 The team at Boxcar, the Letterpress Commons, and Briar Press sites are also a tremendous resource. Don’t be afraid to ask questions and keep asking until you understand. 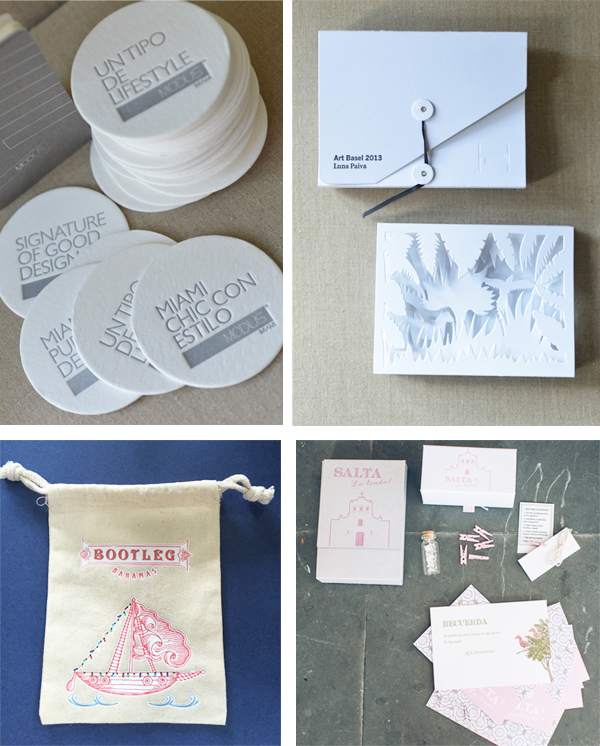 This might actually be the year we get more of our custom stationery line up and running. This is a goal we’ve had for some time…but…life is what happens when you’re busy making other plans! Now that our children are older, we have more time to dedicate to our various printing projects. 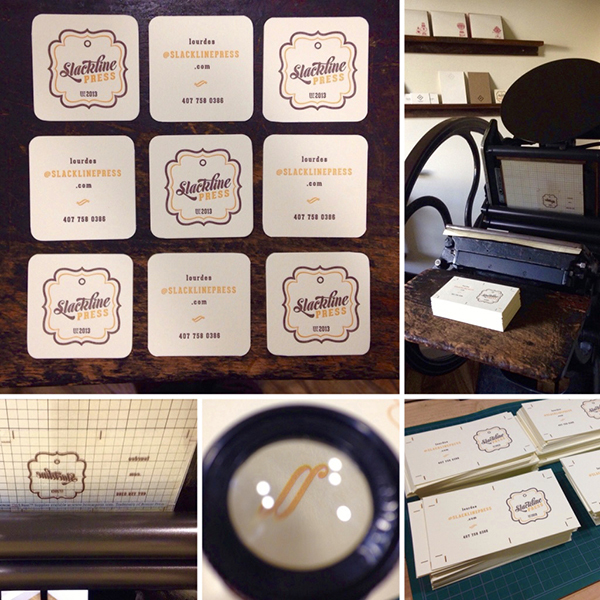 We also held our first letterpress workshop recently, partnering with the Charlotte Chapter of AIGA. 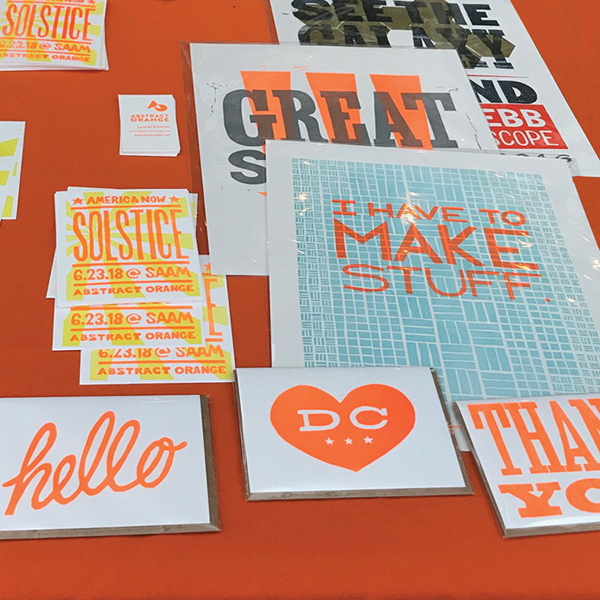 It was a big success so we expect to do more of the same and help spread the love for letterpress and type in the Charlotte region. 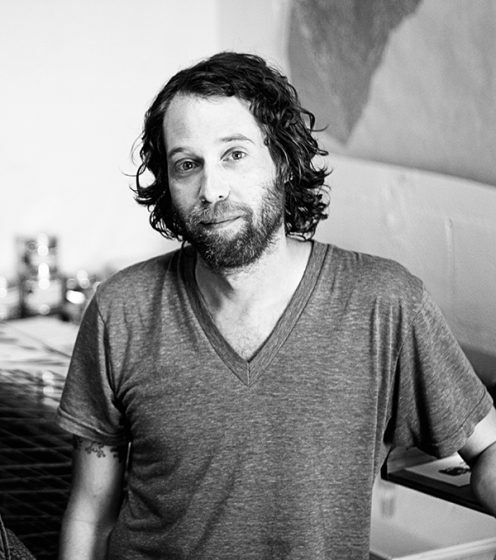 Always on the move, letterpress printer Chris Fritton just might be coming to a town near you. 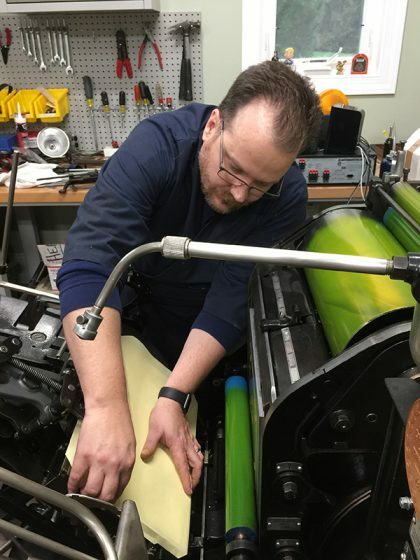 Chris has visited over 160 letterpress print shops in North America, where he is known as “The Itinerant Printer.” As a guest printer, he enjoys making one of a kind prints, cards and posters with his hosts, with the added bonus of the letterpress camaraderie. 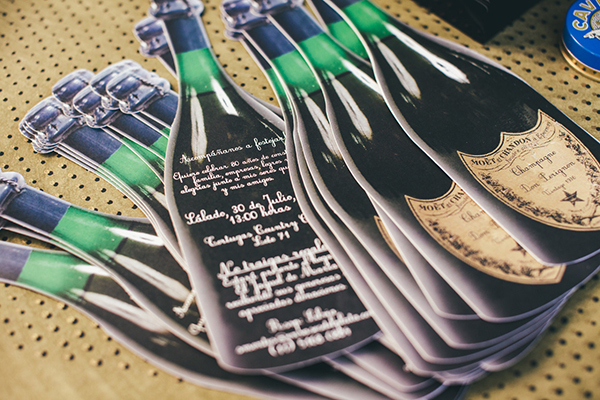 The Buffalo, NY, native shares with us his creative origins and printing on the go. 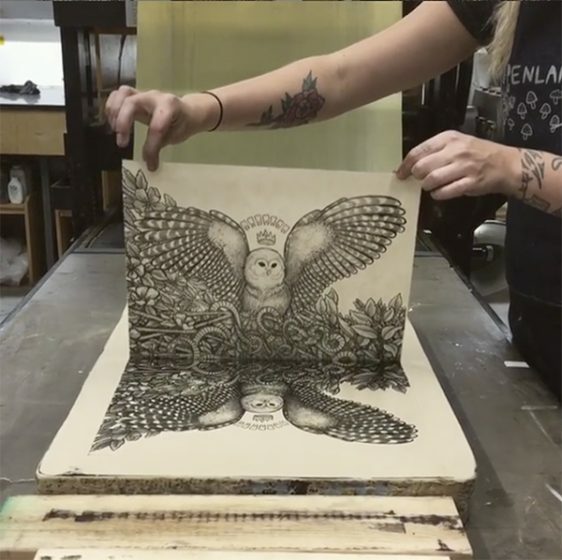 I’m the former Studio Director of the Western New York Book Arts Center in Buffalo, NY, and for the past four years I’ve been doing The Itinerant Printer project. I travel around the US & Canada visiting different letterpress shops, and the only thing that I bring with me on the road is paper & ink. 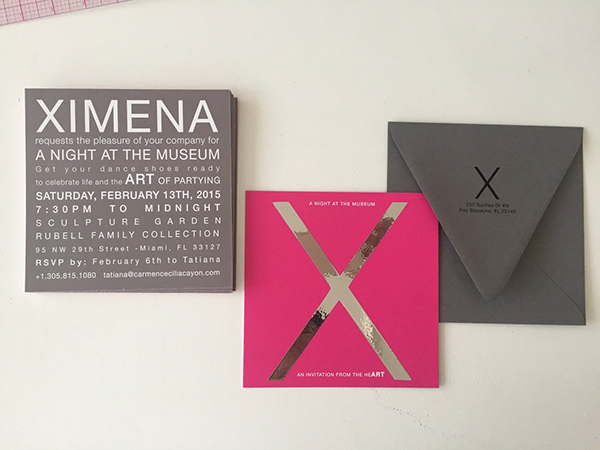 I use what those shops have in their collections (wood type, metal type, border, ornament, photopolymer plates, etc.) to create unique prints. I got into letterpress printing as a writer and a book artist. I started out by making my own cut & paste zines during my teens, and then poetry chapbooks. I learned how to screen print early on, but that never really felt like the perfect medium for me. 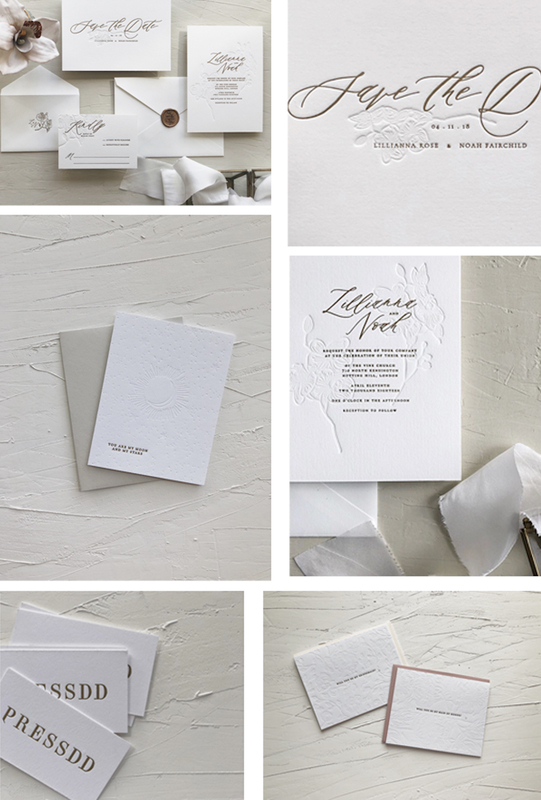 When I found letterpress, everything clicked. There was something so compelling about actually building the language — setting every letter in every word and stanza by hand. It was so visceral and fundamental. 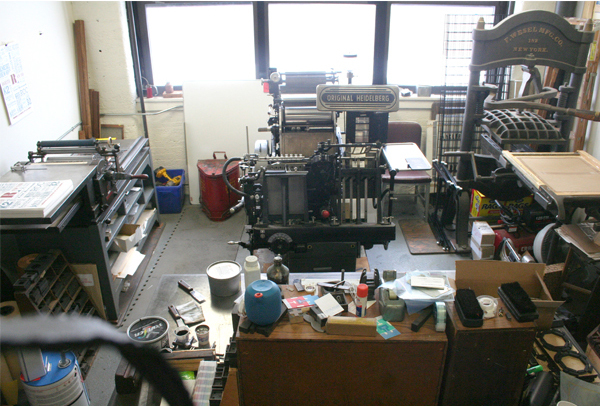 I was lucky enough to print at a place in Buffalo run by one of my mentors, Hal Leader: Paradise Press. 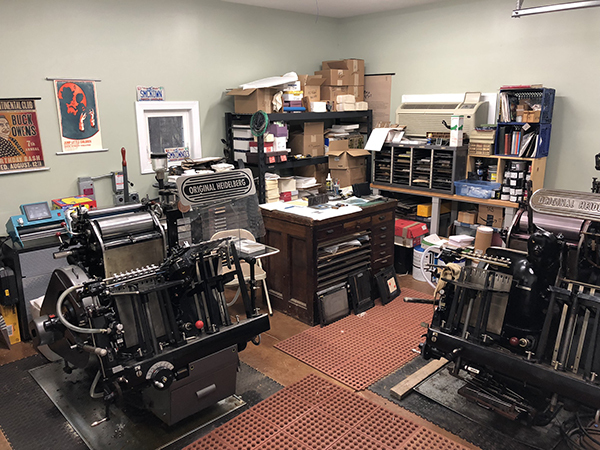 It was a tiny space right in the middle of a modern print shop, and it held all of his type and presses, as well of those of his mentor, a Roycroft master printer named Emil Sahlin. I worked at Paradise Press until Richard Kegler had the idea to start the Western New York Book Arts Center. Then I got in on the ground floor of that project. WNYBAC was my baby, and that’s where I printed for six years. 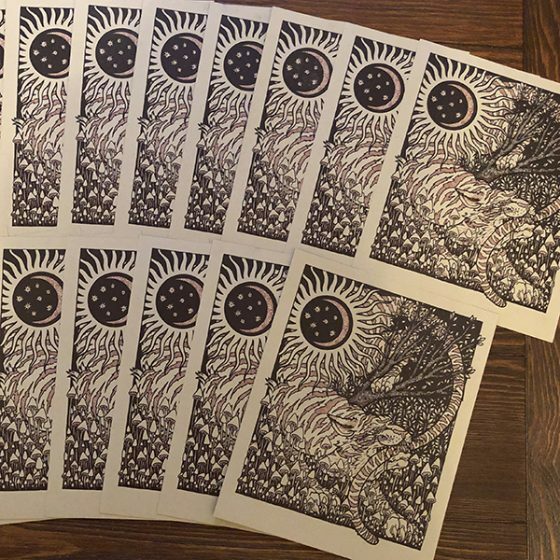 We had an incredible collection that we used to create gig posters, event posters, broadsides, cards, etc. I knew where every single thing was in that shop, from the tiniest ornaments to the missing sorts that were in standing formes. My favorite thing about it was the energy. We were always experimenting, always trying something new, always using alternative materials and processes. It was an incubator, really, and a springboard for what I would do in the future. Now, everyone’s shop is my shop, at least for a day. With The Itinerant Printer project, I’m often only in a location for 24-48 hours. I have to familiarize myself with the shop, its contents, and try to create something interesting. Often, I have no idea what I’ll find; I don’t even know what kind of presses they’ll have. It’s a never-ending challenge, but I wouldn’t have it any other way. All of Buffalo is a cool landmark. It’s a city rife with amazing architecture, copious greenspace, and a revitalized waterfront. The city is steeped in history, and its blue-collar legacy is evident everywhere you turn. I miss it when I’m away, but so many of the shops that I visit have fantastic surroundings as well, from Menagerie Press in Terlingua, TX, among the Chisos Mountains to the School of Visual Concepts in Seattle, WA, with a view of the Space Needle. It’s impossible to choose a favorite. Although I look to the past for ideas sometimes, I tend to appreciate the work of my contemporaries just as much, if not more. I really like the work of modern letterpress printers who are combining analog & digital technologies to get intriguing results. 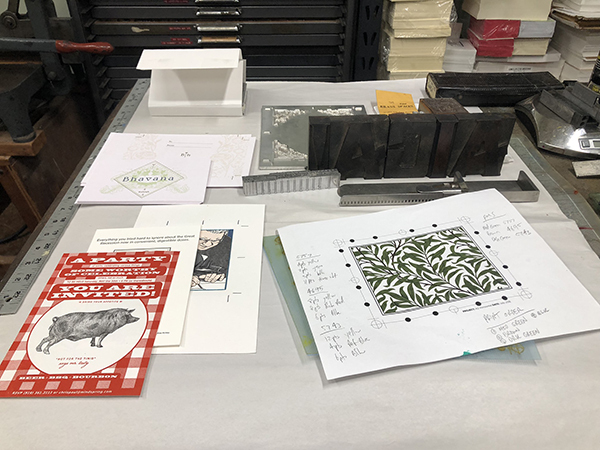 Right now, off the top of my head, James Tucker of the Aesthetic Union, Brad Vetter, Dafi Kühne, Kathryn Hunter of Blackbird Letterpress, Lindsay Schmittle of Gingerly Press, and The Print Project in the UK are churning out astonishing work that looks like nothing else. 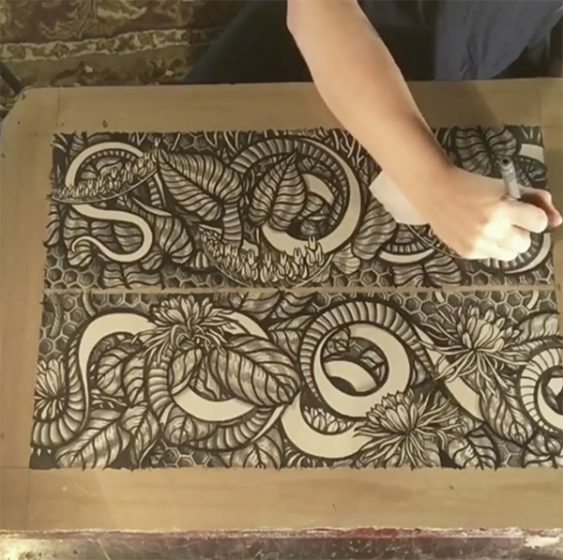 It’s their openness — their willingness to embrace something that may or may not work, as well as their desire to make something that doesn’t look like traditional letterpress that makes their work so arresting. The Itinerant Printer project is a full-time job for me, much like a traveling band. I often take a break during the summer, however, and when I’m home in Buffalo, I run commercial vessels on Lake Erie as a “day job.” It’s a nice break from printing and traveling, and often I find that I feel recharged when I return to letterpress. When I’m on the road, because I’m going in blind, I have to design on the fly. Because I’m normally using movable type, I design primarily on the press bed (if it’s a proofing press), and have to make decisions about color & form very quickly. The experience has made me very decisive, but also accepting of failure, because when you’re working that fast, it doesn’t always work out the way you thought it would. 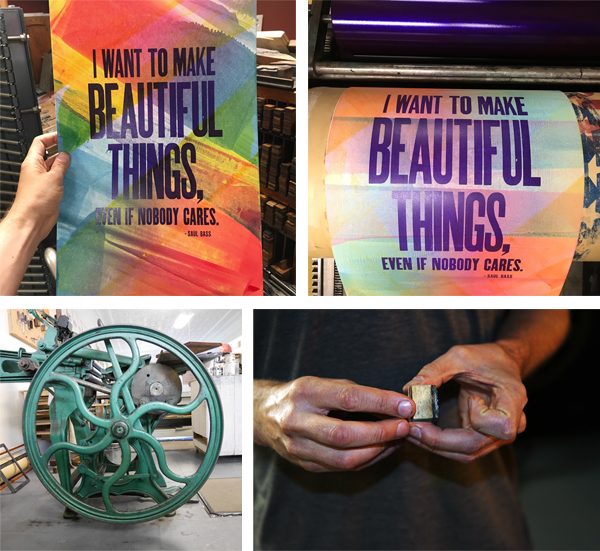 To date, I’ve visited over 160 letterpress print shops in 45 states and 4 provinces. I’ve covered over 60,000 miles and made close to 25,000 prints on the road. That feels pretty noteworthy to me. 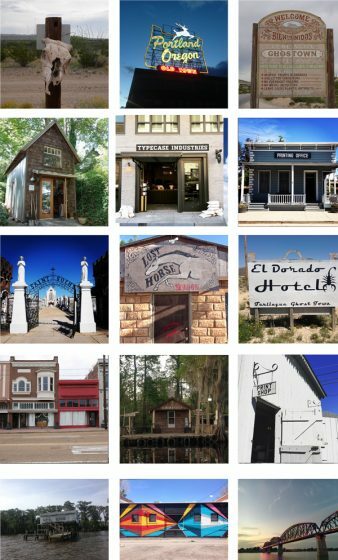 To culminate the whole adventure, I recently finished a 320-page coffee table book comprising 1,500 photos and 130,000 words that tells the story of all the people, places, and prints along the way. The book is a monster and it had to match the scale of the project. Here’s a fun fact: I’ve never owned a press. 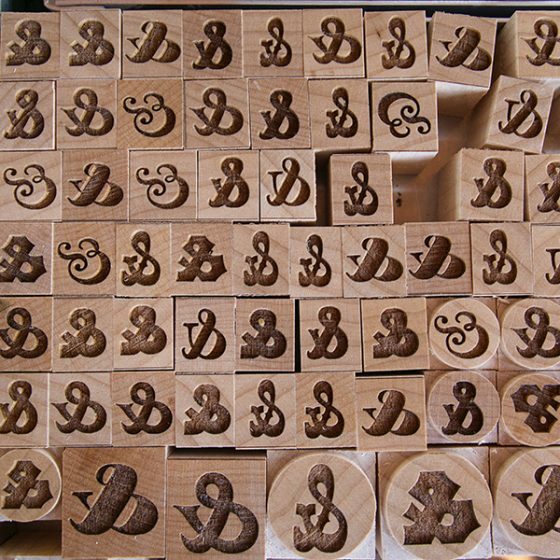 I have a great collection of wood type and sundries, but no presses. At this point, it wouldn’t make sense to get one either, as long as I’m on the road. 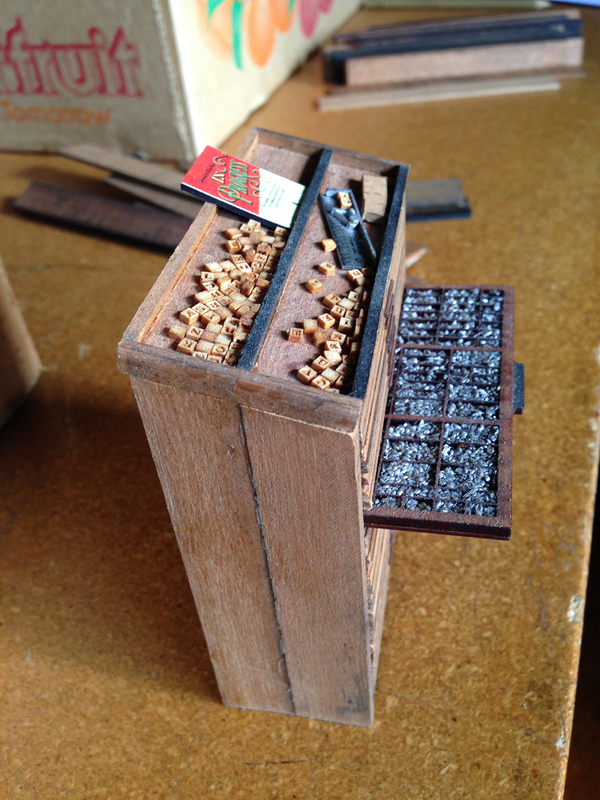 Boxcar was elemental when we were doing jobbing or custom work at the Western New York Book Arts Center. It was the fastest, easiest, most reliable way to get the results we needed. When I’m on the road, Boxcar is the first name that comes up in every shop for photopolymer platemaking. It’s amazing to see how far its influence stretches, to every corner of the US & Canada. Perhaps a useful letterpress printing technique? Baby wipes with a little bit of baby oil for cleaning your hands. It acts as a solvent for most inks and keeps you from running to the bathroom every thirty seconds to wash up. 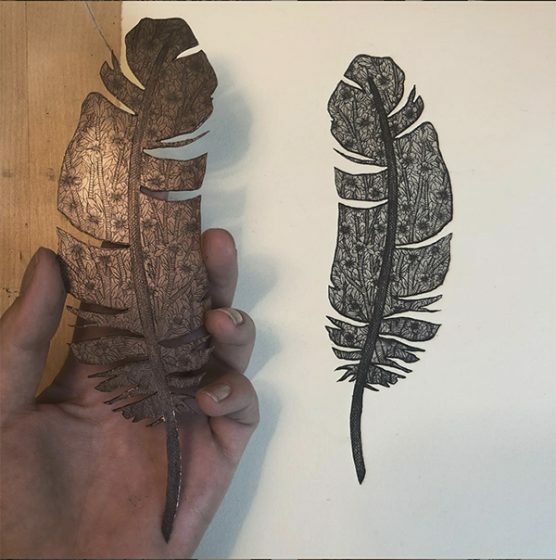 Other than that, employ as many techniques as you can to get the results you want: pressure printing, laser cutting, 3D printing, woodcut, linocut, photopolymer — don’t restrict yourself. 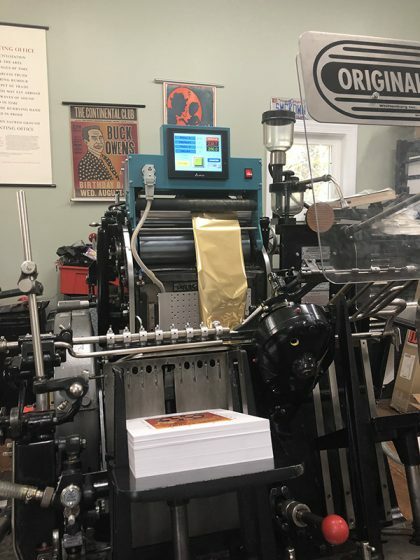 In 2019, I’ll round out The Itinerant Printer book tour. After that, I’m considering taking the project global in 2020 — The Itinerant Printer, around the world. I can’t wait to see what printers in other countries are doing, as well as spend time learning about them, about their presses, about their cultures. Logistically, it will be a lot different than the North American tour, but I know it’s possible, so keep your eyes peeled for a launch date! Crafted with care, hypnotically delicate, and dizzyingly detailed are what instantly come to mind when viewing Ali Norman’s body of printed work. 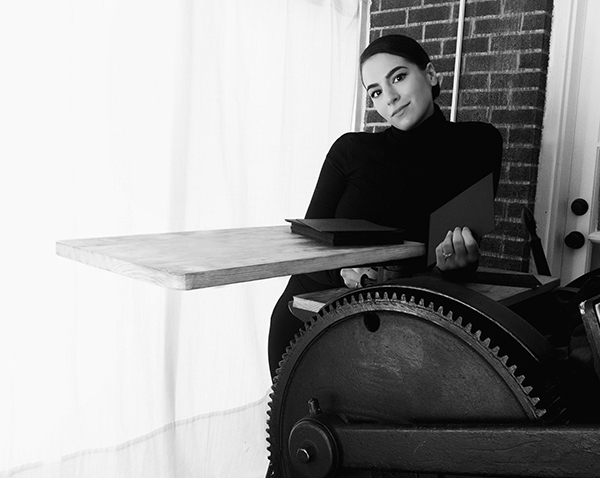 A traditional printmaker by nature, Ali enjoys expressing her vivid concepts through silkscreen, etchings, and now letterpress. 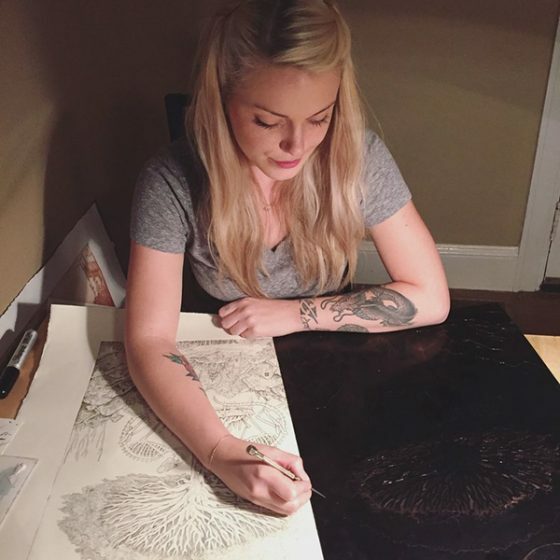 The Florida-based printer shares with us the joys of learning new techniques, infusing nature motifs into her work, and pushing the limits of her art. I’m a printmaker with a huge passion for etching, but I also love to dabble in other processes (such as letterpress!). I first learned about it from the amazing Eileen Wallace during my MFA. She helped spark my interest and encouraged me to push the limits of my polymer ideas. Learning from her was an incredible privilege! Currently, I have access to etching presses at home and at work (the University of Tampa), but no real letterpress access. 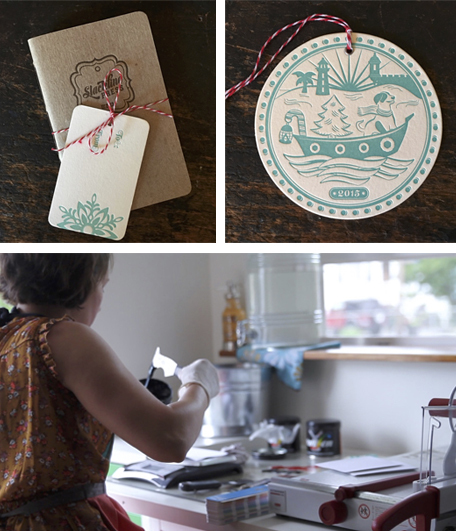 I’ve been lucky enough to make friends with Sarah and Phil Holt, who have the cutest little letterpress shop at home! They were very kind to let me use their beautiful orange Vandercook to print my most recent polymer creation. I’m hoping to work with them more in the new year! 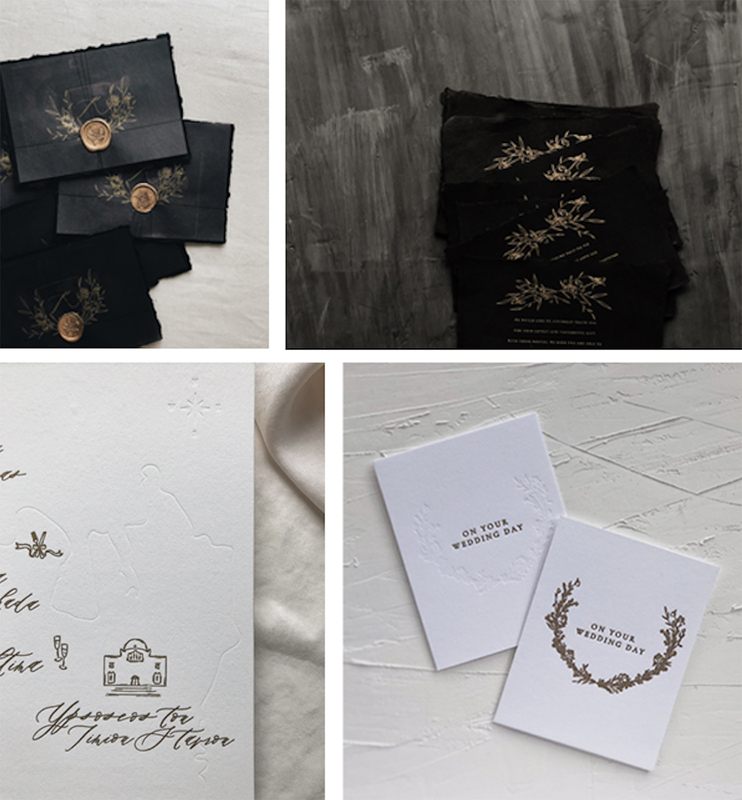 You can check out Sarah’s letterpress work on instagram at @monpetitpaperco. I am really inspired by and thankful for the amazing printmaking community that has popped up on Instagram. I have “met” so many amazing artists and learned some cool techniques just from the internet. 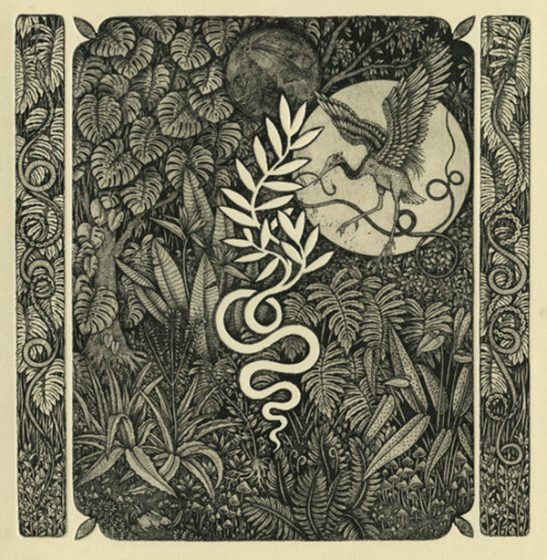 On a more personal note, I pay close attention to my dreams and am strongly attracted to old engravings, magical texts, and tattoo linework. I am not currently printing full time. Having just finished my MFA in the spring of 2018, I’ve been teaching part time at the University of Tampa. This gives me a good amount of free time to work on making and selling art on the side! So far I am finding it to be a really healthy and rewarding balance. Although I grew up here [in Florida], I haven’t been back for quite a while! I’m still currently exploring the area. I absolutely LOVE designing for photopolymer!! I’ve found that drawing the key layer first on tracing paper allows me to then flip-flop my ideas, scan them, and easily draw color layers. I’ve tried working more digitally, but always go back to the tracing paper! Works take me anywhere from a week to two months to complete before printing, but I’m always working on a few things at once. I try to keep it slow and steady, drawing at least a little every day until I am satisfied. I also often work back in to images, so that can end up dragging things out… as goes printmaking! 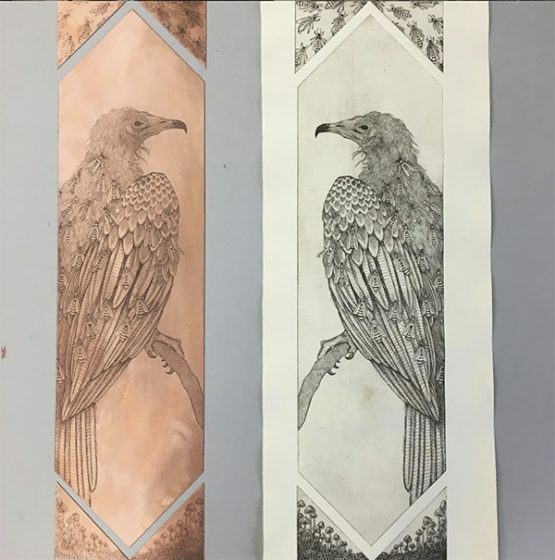 Intaglio will always be my go-to process, but it’s not always very practical! I like to change things up, especially with quicker processes like letterpress or lithography. It is so satisfying to see a trapped layer lock perfectly in to place each time, and to feel like one with a machine. I also really enjoy how the design process for each technique is so different – it keeps me on my toes! At this point in my career, I am just very proud and grateful to have made it this far! I’ve been working hard to make my passions a reality and am really seeing that come back to me lately. I currently have a little tabletop Conrad E12 etching press that was found by a friend of mine at a thrift store! After some heavy cleaning, I now use it almost constantly. I’m hoping to also have a letterpress to call my own some day. 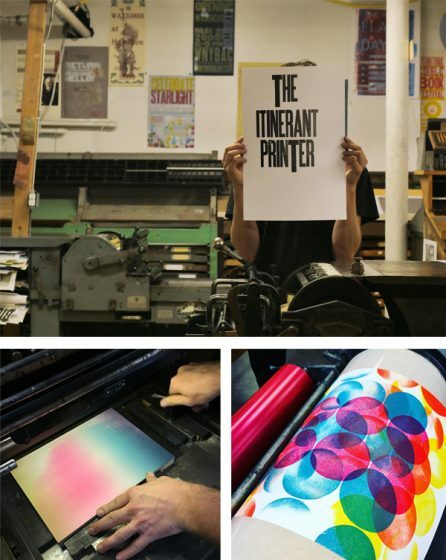 Floridian printers – hook me up please! I had my polymer plates for my most recent print made by Boxcar Press! I was a little nervous about someone else making my matrices, and they turned out perfectly. I’m really grateful for this service. I’m still quite the beginner at letterpress, but I manage to learn something new every time I print. I even managed to smash my fingers in the Vandercook once (oops!). 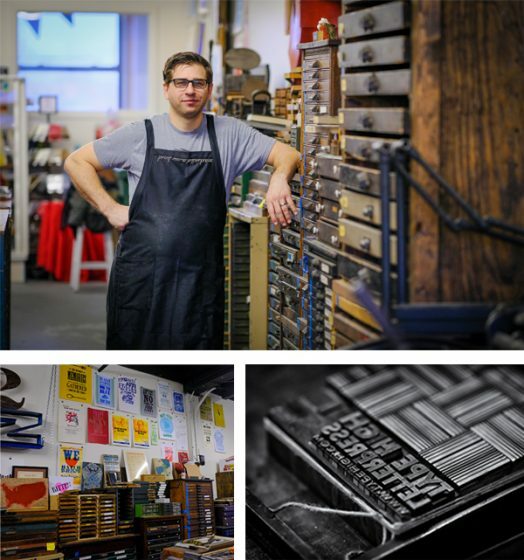 Right down the highway from Syracuse, New York, is Rochester’s very own Type High Letterpress. 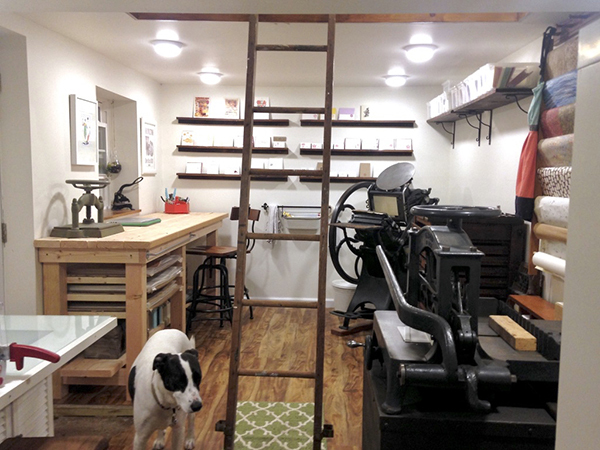 At the helm of this cozy, treasure-packed print shop is Tony Zanni. From wood & metal type goodies to presses that shine, Tony gives us a tour of this hidden gem tucked away in upstate New York. 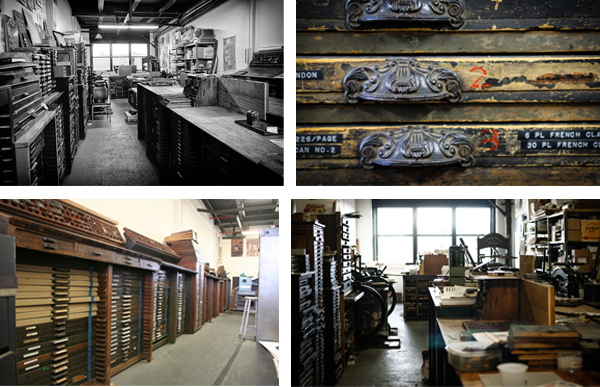 PRESSES AND WOODCUTS AND TYPE, OH MY! Our shop is located on the second floor of an old candy factory in downtown Rochester, NY called the Hungerford Building. It houses around 40 other artisans of varying crafts. We occupy a 1,200 sq. ft. space that is long and narrow. At the front of the shop is a small retail area. The rest of the shop is packed to the gills with over 700 cases of wood and metal type, and over 150 galleys of dingbats and cuts. At the back we have our 4 large presses: a Damon & Peets 8×12, Heidelberg Windmill (with factory foil stamping attachment), a Vandercook No. 3 Proof press and a giant Wesel Iron Handpress. We also have a fun collection of small table top presses hiding around the shop as well. The space in and of itself isn’t really interesting, however, what it’s filled with captures imaginations and inspires creativity. 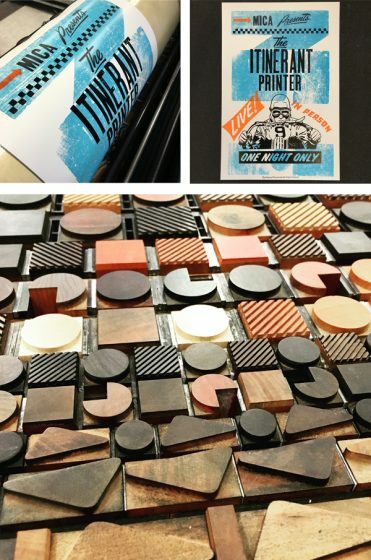 There are all sorts of letterpress goodies to look at. 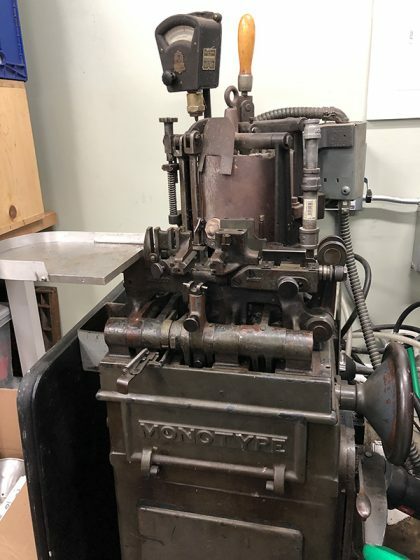 We have originals of Adobe’s Wood Type Ornaments typeface, old wood cuts from various shops around the western NY area, slug cutters, miterers… The Hell Bucket. There’s a lot of stuff to look at if you ever visit. This is going to sound funny but my favorite thing about the shop is that it’s heat included. Our original location was a bit better but boy was it cold in the Upstate winters. The new space… Toasty! As for fun things / prized possessions, there’s a couple. First would have to be my Vandercook, Izzy. Yeah, I named her Isabelle or Izzy for short. I found her thanks to Shelly at French Press. I asked Shelly to visit this estate sale (because I couldn’t attend) and had her look for Vandy’s. She called and said there was a Vandy in the garage, mostly complete. I said great, put me on the phone with the seller, offered $500 sight unseen. They said yes and I picked it up two days later. I honestly think this was the last $500 Vandercook to be had and this was back in 2009. This past summer I acquired another nifty item: a Lufkin 6 ft. tape measure with inches and Pica rules on it. Maybe not super practical, but pretty cool. One more super cool thing I have is an original plate of the very first Photographic image printed in a magazine. It is “A Scene in Shantytown, New York” that appeared in the March 4, 1880 issue of New York Daily Graphic – the first halftone photograph ever printed by a newspaper. Yes, we have a pretty cool collection. I jokingly refer to my shop as the “train car”. It’s about 15′ wide by 65′ long and has 3 windows in the back and a double door up front. With any luck we’ll be moving down the hall later this year a space that is 1500 square feet. I’m not looking forward to moving all this again. We are in the Hungerford Building. surrounded by many other creative artists. On the first Friday and second Saturday of every month we host events. We are the northern border of an area called the Neighborhood of the Arts. About 3 blocks away are the Memorial Art Gallery, Anderson Alley Arts building, plus a host of other galleries & public art pieces. Type High is a commercial letterpress print shop specializing in hand set typography and design for letterpress printing. Obviously, I use Boxcar Press for our plates when the need arises. 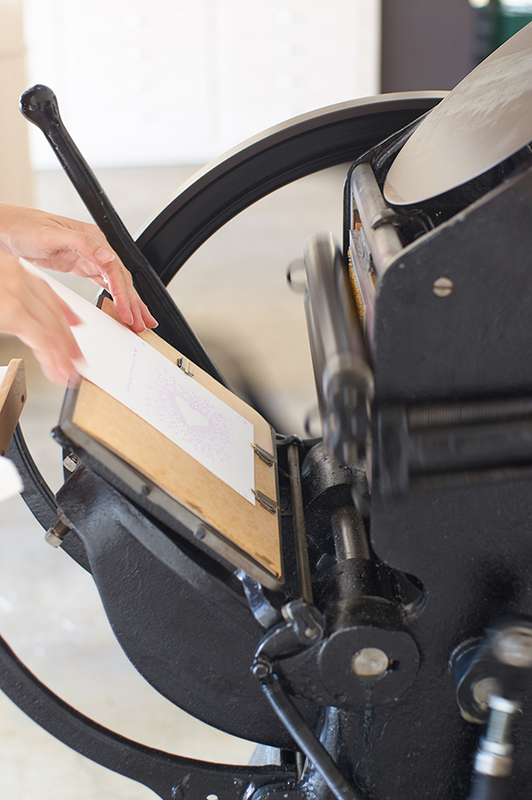 We teach letterpress workshops in our space, how to set type properly and print an edition. In addition, I also teach a semester long letterpress design class for the Rochester Institute of Technology. The most valuable tool in my shop is my line gauge, Pica Stick, ruler… whatever you want to call it. My favorite one is a Gaebel 612H-12 with inches, Picas, Points and millimeters. Not only is it great for measuring and drawing straight lines, but it’s also great for opening ink cans, cutting open packages, getting things out from under the press. Not to mention, slicing pizza, and cutting cookie cake on those special occasions. My favorite inks are from the old cans we pull out of shops that we buy out. The older the ink, the better the coverage. Plus it’s usually free and we’re saving it from going to the landfill. When we have to buy new stuff, it’s usually Van Son due to ease of ordering with our local supplier. Don’t tell anyone, I order California Type Wash. It’s an older solvent, that’s probably not as good for the environment as some of the newer stuff but it’s by far the best i’ve ever used. It cleans quick, dries fast, and will take 100 years of ink off in only a few wipes. I like to challenge myself when cleaning up the Vandercook to do it only using one or 2 rags at the most. For most jobs I need plates for, I use the Boxcar Base and polymer plates. My base is beat up, but it still does the trick. To be honest, I hate printing with polymer plates. It’s been my experience that the ink does not carry well, and they can be finicky at times with the amount of ink on the roller and the roller height. Since we go in between hand-set type and plates, it is challenging at times for make-ready. You’re supposed to oil these things? Honestly, I just use the same oil I use for my race car. If it’s good enough to run at 6000 RPM for an hour in a race car it’s good enough for a press. I’m cheap… I use Scotts Rags in a box… but only the ones from small mom and pops hardware stores, because they are different from the ones at Home Depot. I just recycled a 91 lb. bucket of pied worn out old metal type. However, there’s still standing forms from shops we cleaned out years ago. Some of the type from those shops may have been sold or dumped at this point but the standing forms are still in our galley storage. There are also 5 drawers of miscellaneous wood type hiding in the shop. I need a few more hours in the day to handle pied type. I guess the only secret I have is a Sharpie. I have a pretty photographic memory for where my type is, what it is, and to where that random Cap L needs to go. When I take something out to use, I write in Sharpie the cabinet and drawer number on the back of it. Other than that, as long as I put it away I know right where it is. When I don’t, well let’s just say I swear a lot until I find it. Things I wish I knew from day one: How to price my work for lines of type setting, vs pricing a computer-aided design. And pricing for press time vs make-ready time vs finishing time. That probably needs to evolve for each person. As a one man shop, it’s tough to figure all that out. If anyone has a magic button for that, let me know. 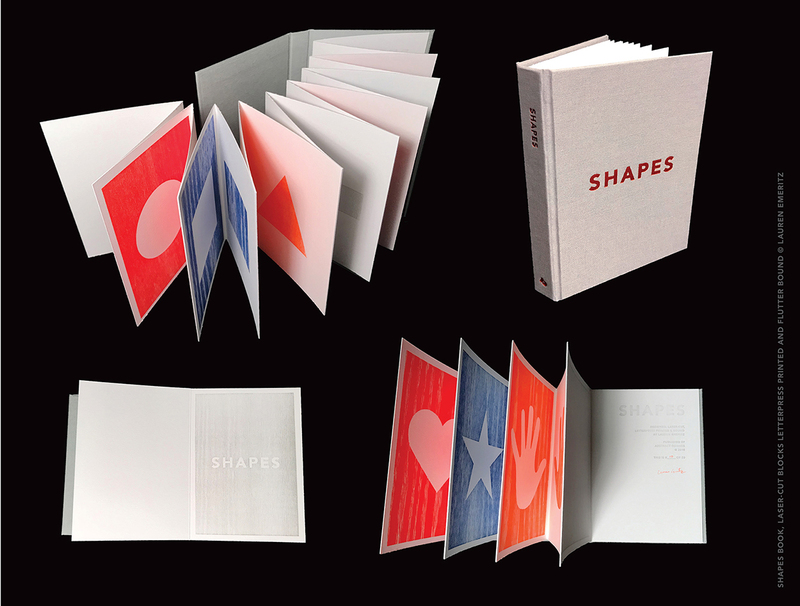 Graphic designer & printer Lauren Emeritz creates brilliantly colored fine artists books & punchy prints. 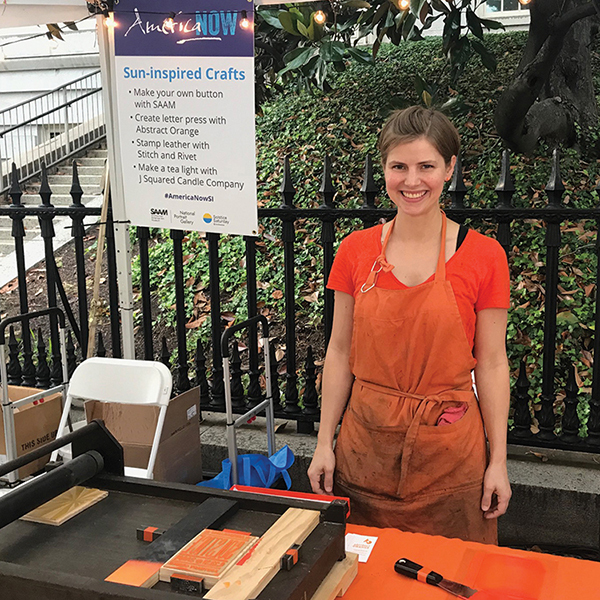 Lauren talks about teaching printing at an area Community Art Center, creating artists books, and introducing many to letterpress at events in the Capitol area. 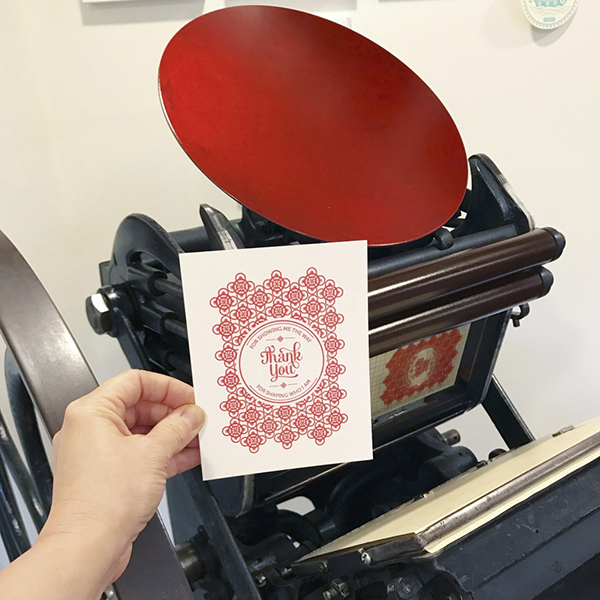 I am a graphic designer, letterpress printer, and book artist in Washington, DC and have always loved type and printing. While attending the University of Delaware, they were beginning to set up a print shop. I was fortunate enough to have the opportunity to print. Now Pyramid Atlantic Art Center is my go-to print place. 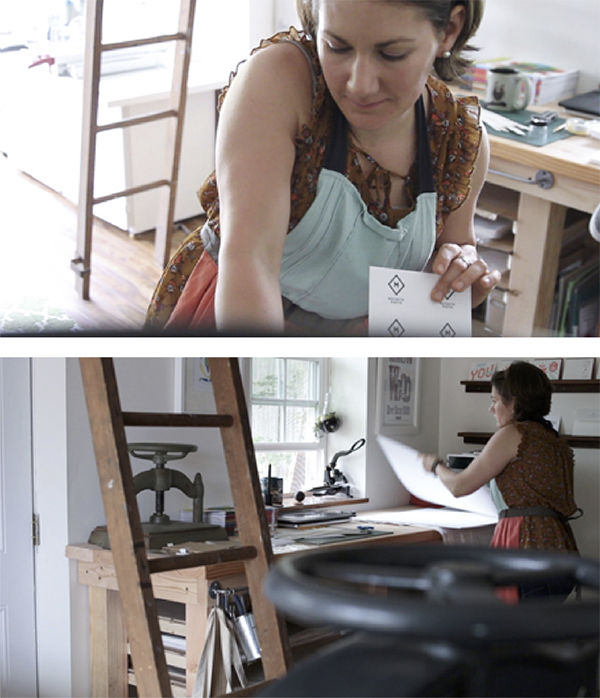 I print at the amazing community art center – Pyramid Atlantic Art Center (PAAC). 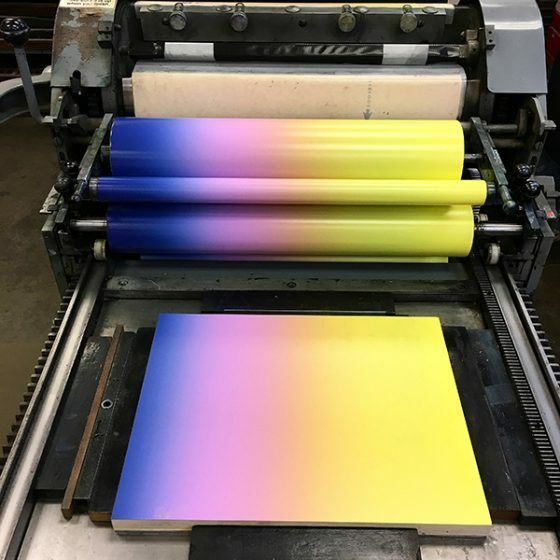 Unique to the DC-area, PAAC offers workshops on how to learn to print, and the rental of presses to print on your own. I discovered PAAC at their Biennial Book Arts Fair. This fair is home to beautiful art made by hand. But ultimately, this created a spark in me to reconnect with making art by hand. I live in DC, so there is lots of cool artsy stuff. I love the Smithsonian Art Museums, the National Gallery of Art, the Library of Congress — they have so much amazing art and printed pieces! The Library of Congress was on my bucket list for a number of years. I finally made it there for an American Printing History Association (APHA) event. It was awesome and now I try to go back every couple of months. Ray and Jill at Lead Graffiti do cool work and love to share their knowledge. Vince Frost is a graphic designer who used a lot of wood type in his designs. When I teach at Pyramid I get inspired by the people in class. 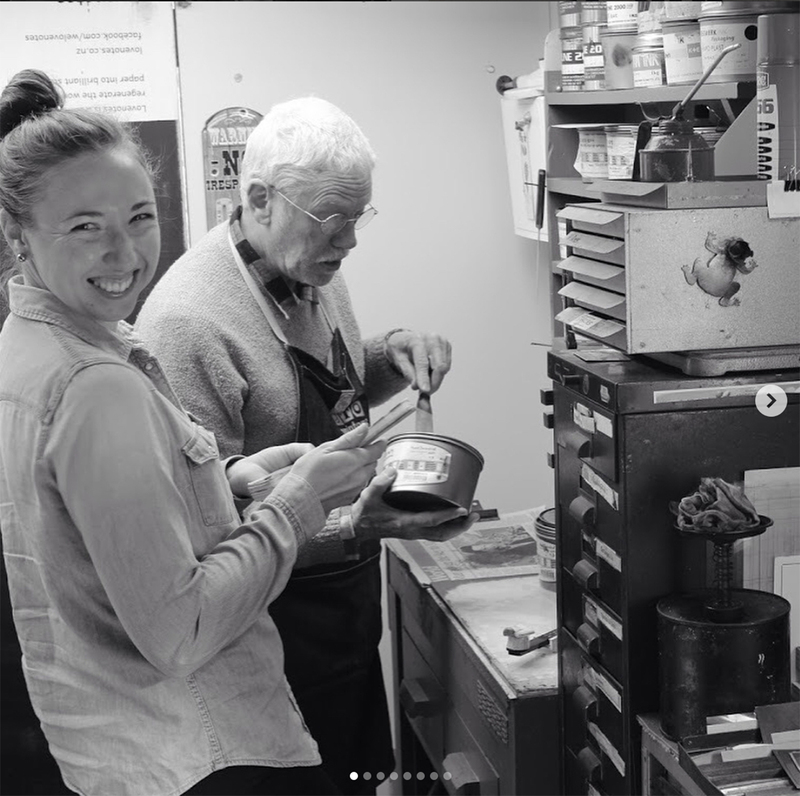 I get to share my passion for letterpress: type, ink, paper, and printing with people who may love it too or may not have done it before. It is always fun to see new ideas and the directions people explore. I did an internship at Hatch Show Print in December 2017 and it was wonderful to have access to so much wood type — one of the first things that I loved about letterpress. The people were so creative and friendly and the shop was AMAZING – I highly recommend a journey there! I would love to go back for an artist residency sometime. My primary job is as a graphic designer for my company Abstract Orange. I enjoy printing and I do it mostly for fun. While I would love to do it full-time, I am concerned that if I printed commercially it might lose the satisfaction. Teaching at Pyramid keeps me fresh and experimenting. When I letterpress now, I use a combination of techniques. For small text and logos I usually use polymer. For hand-drawn type I usually carve linoleum or wood blocks. Each process has it advantages and I try to be intentional in my process, using the one that will best suit my goals for the project. I made a Hand-Carved Alphabet book that I sold to the Library of Congress. At one of the APHA events, I sold my book to their special collections. It was one of the most exciting and validating events in my life. I started the project several years earlier without any particular goals or directions. Through a series of events, the book ended up in a show on a table next to works by Edward Gorey and Frederic Goudy! As a type nerd, Goudy has a special place in my heart! 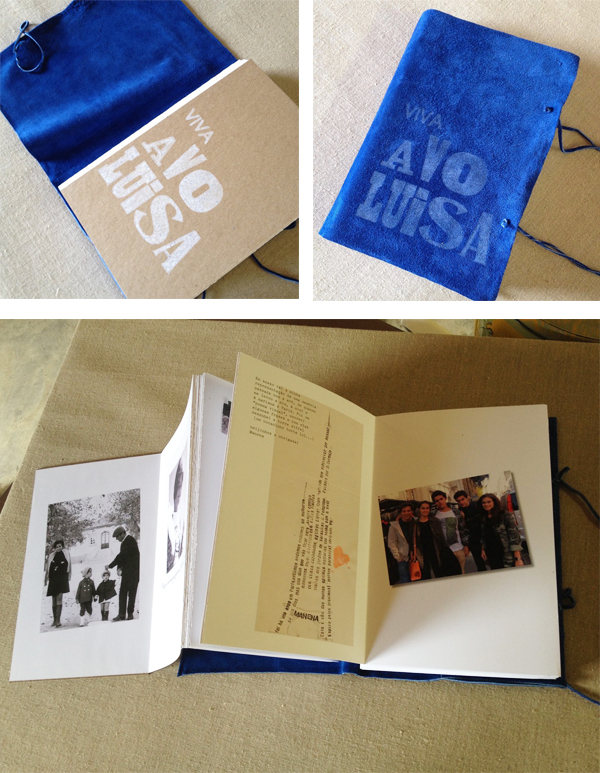 I picked-up my bookmaking skills from a number of places along the way. 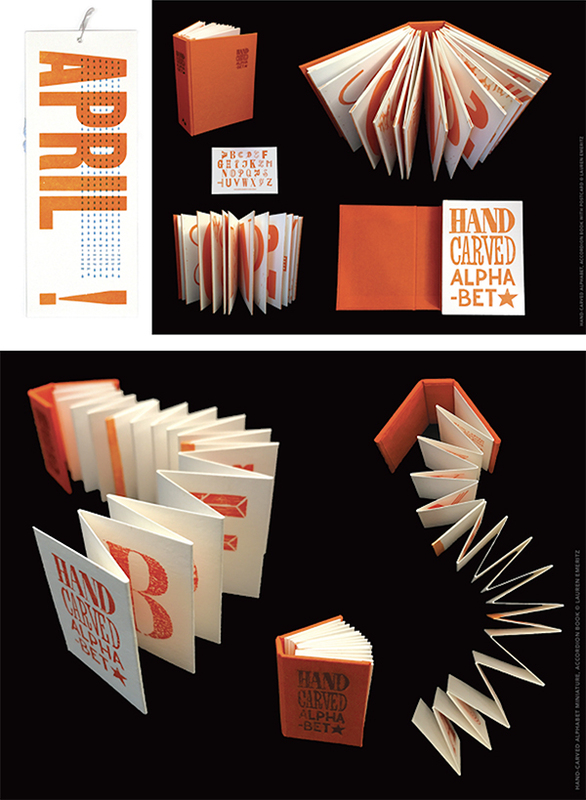 I started with different portfolio books at University of Delaware; workshops at Hamilton Wayzgoose; Ladies of Letterpress conferences, New York Center for the Book, GW Corcoran, and AIGA DC. The bookbinding associates at PAAC are always amazing and helpful. My first press was probably my hands. I loved making rubbings. I own a Vandercook 99 (that is one without an inking system). My Vandercook 99 lives in my basement. 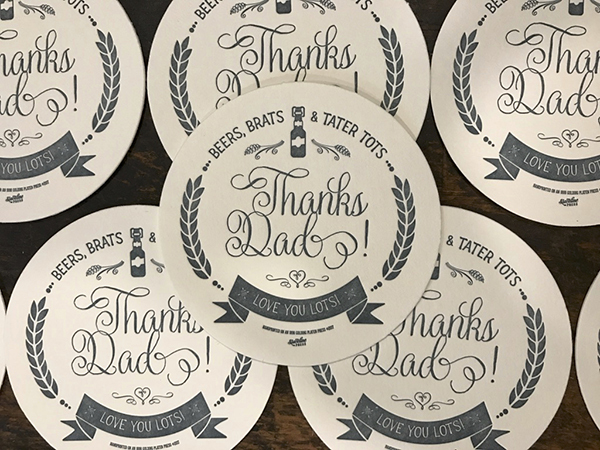 I print on it sometimes, usually small runs or irregular things you couldn’t print on a larger Vandercook, such as round coasters. I have also used it for printing demos/workshops at the Smithsonian American Art Museum, Renwick Gallery, and Shop Made in DC. Because it is smaller and only 110 lbs, it is fairly portable for demos. 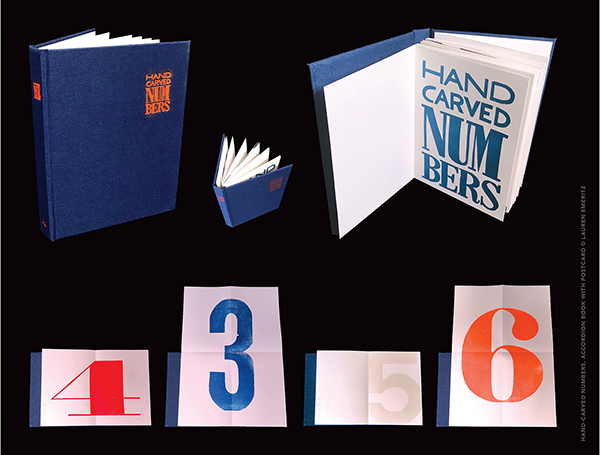 Boxcar Press really revolutionized letterpress printing. I realized at some point that things were being letterpress printed using fonts that were more modern than lead type. Next, I figured there had to be a way to print modern computer designs on the letterpress — and I found Boxcar Press! I love the merging of old and new technology and combining my computer design skills with hands-on printing techniques. I tell my students who are interested in polymer to check out Boxcar Press because they “invented the system” we use to print polymer. At the moment, I have been printing some neon orange lately. It is lots of fun! 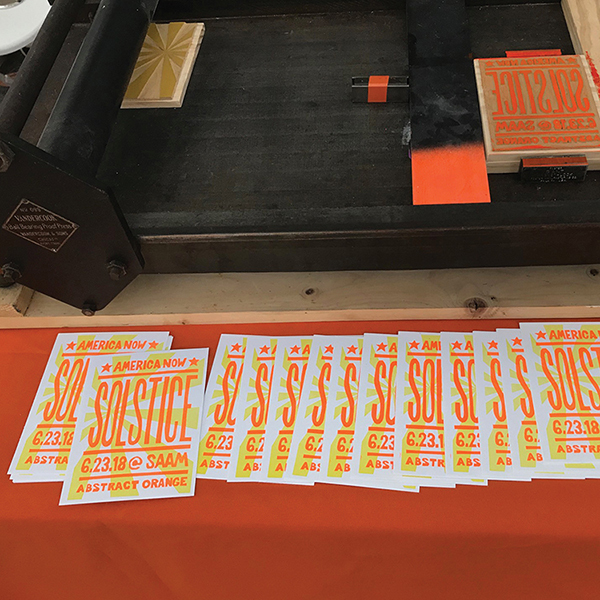 Very recently, I did a letterpress printing demo with the Smithsonian American Art Museum to celebrate the Solstice. I’ve also taught a Hand-Carved Type Workshop at the Ladies of Letterpress Conference in October 2018. I am not sure where 2019 will take me, but I am excited about the possibilities! 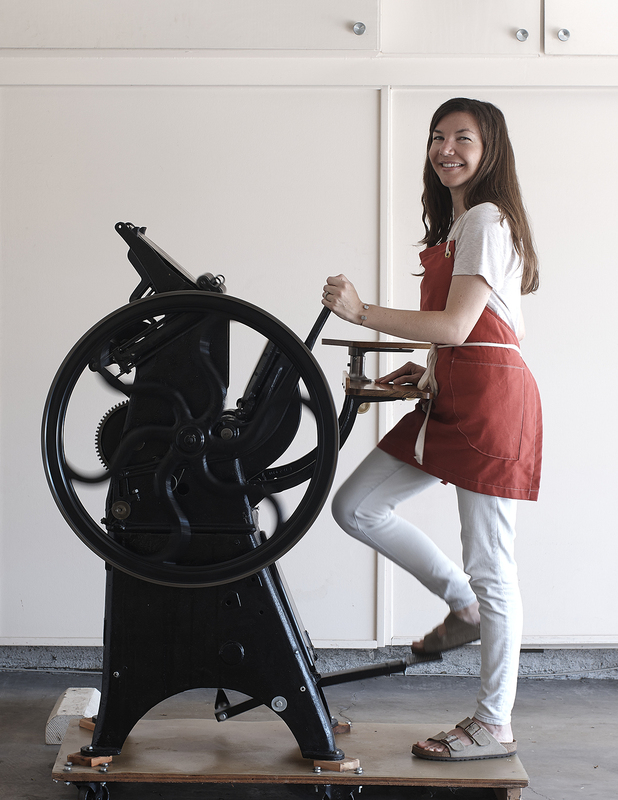 Newly fledged full-time architect-turned printer, Lauren Ralph of Helen Edna letterpress shares with us her printing journey so far. 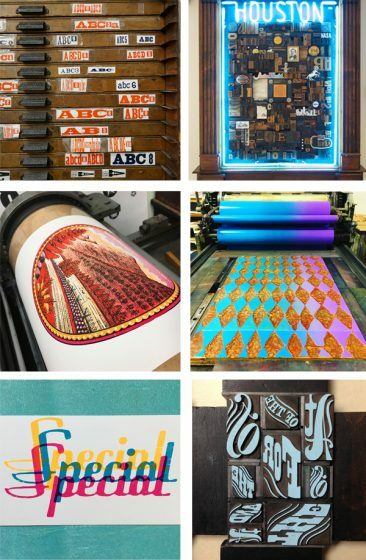 From being inspired by the vivid color palettes of Van Gogh and Kandinsky to taking up printing lessons at the International Printing Museum in Carson, CA, Lauren’s bright and clean designs reflect her dedication to the printing tradition. I began my career as an architect. Shortly thereafter, I came to the realization I missed working with my hands. 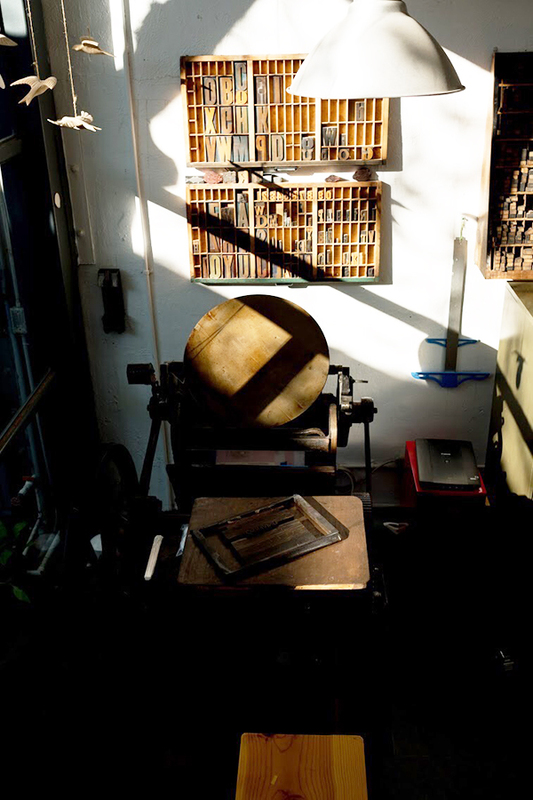 The summer of 2018, I embarked on a new journey and opened my letterpress stationery studio, Helen Edna. I took printing lessons at the International Printing Museum in Carson. My favorite part was learning the printing process and being able to print my hand-drawn designs and turning them into cards. As a result of the printing lessons, I bought a Golding Pearl. Next, I made the leap to start Helen Edna! Letterpress cards in boutiques are something that I have admired. Being able to design and print my own cards for people to enjoy is something that brings me great joy. I live a really neat area in California that is close to just about everything. My house is near the Headlands Conservation Area, Dana Point Harbor … and next to Strands Beach in Dana Point. All the design work and order fulfillment takes place at my home in Dana Point. While all the printing happens at my husband’s grandmother’s home (which is nearby). One of my printing mentors would be Mark Barbor, the International Printing Museum Director. Not only did he give my husband and I a printing lesson at the museum. Even more, he has been helpful in getting me started. In addition to Mark as a printing mentor, artists such as Van Gogh and Kandinsky are inspirational. Over the last several months, I have been printing full-time. It is a true pleasure in seeing my designs come to life! How does the creative process begin? First, I begin drawing thumbnail sketches in pen and ink. Next, I take a photo of the design is uploaded in Adobe Draw. From here, I use the Apple Pencil to create the illustration. After this, I export the drawing into Adobe Illustrator and adjust the Pantone colors. Finally, I prepare the design file to send to Boxcar Press. The design file includes adding registration for the designs that are full-bleed. One of my biggest printing feats is opening Helen Edna. Opening this store is something I have dreamed about for years. A Golding Improved Pearl No. 11, which I bought from the International Printing Museum in Carson, CA. Boxcar Press’ customer service is impressive. They have a really fast turnaround, are always very polite, and willing to help with any questions you may have. I have three pieces of printing tips. My first, If you are looking to save time … for card designs that are not a full bleed (and have a good margin around the design) I order precut and folded A2 Crane Lettra, from Astro. My second tip, to achieve the perfect registration try overlaying your design with the printed design on vellum. The final printing tip, if you are looking for Pantone ink colors to be spot on, and able to apply directly from the tube onto the disk, check out Southern Ink. 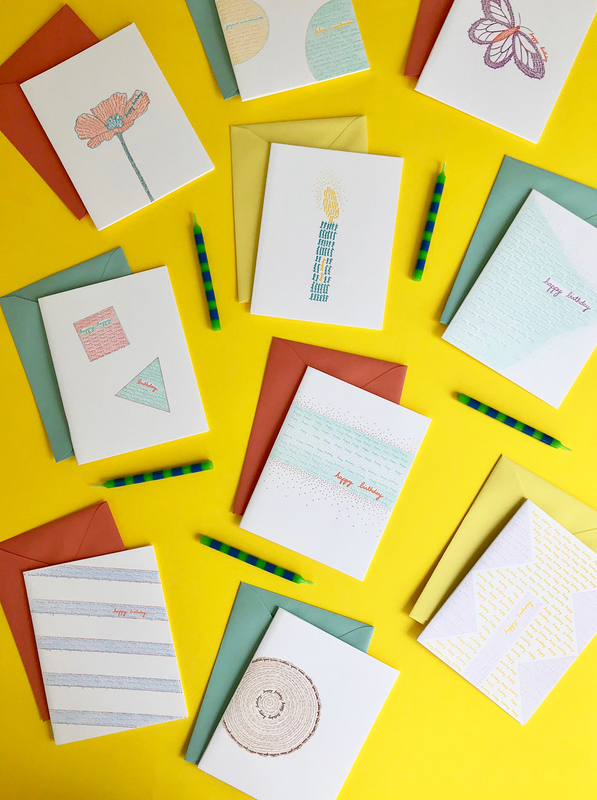 I’m hoping to exhibit at the National Stationery Show for the first time! I also plan on doing more craft fairs and continue to play with designs for my line. Immensely large round of thanks + appreciation out to Lauren of Helen Edna! 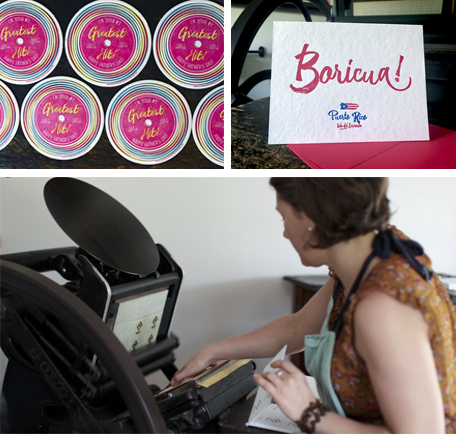 Join Boxcar Press on this “adventure of a lifetime,” as we get a first-hand look at Miami based printer, Catalina Rojas of Puro Papel and find out how she brings the heat when it comes to passionate letterpress printing. Best known for her vibrantly colored projects (both printing and non-printing) discover how Catalina’s worldly travels inspire her work, creativity and how she shares this printing tradition with her local community. LIFE’S ADVENTURES & LETTERPRESS We all have a starting point, an origin. In many cases, they shape and determine the type of person you become. I was born in an area that was rooted in the Catholic faith and traditions. While this was my origin, the dialogue I have with myself, I believe I don’t come from a place … more so, I come from a way of life that was instilled by my parents. My parents were travelers and never ceased to seek the zest for adventure. With two kids on the hip and a Great Dane, they were never deterred by what others might think and managed to stay true to their “hippie-chic” ways. At one point, my aunt and her boyfriend joined our entourage and many people would confuse our family for a circus troupe. During my first five years, we traveled through South America. Quite literally, through the roads less traveled by. Zigzagging through cities, towns, forests, plains, deserts, and jungles. However, there was one significant life trip that would determine how I would experience life, my sense of self and ultimately my creative process. All the details and memories of this trip come rushing back … like having bananas for breakfast, or crossing rivers in long wooden canoes and sleeping in hammocks. I remember feeling the heat from the bonfire and seeing the ashes flying and floating like dragonflies. I remember hearing the speaking drums and the chanting. All of these things on the trip seemed to me like a lifetime and an irrevocable art of me … despite the fact that neither my parents seem to remember it in full detail (and color) as I. They would even go as far as saying that trip was rather uneventful. This trip shaped how I look at life – I live in adventure and in meaningfulness. My work is an inextricable part of my life. I take every assignment as an adventure, in which I try to discover essence, textures, tones, colors and other delicacies. To later bring together these elements and materialize them in a simple design, or concept. 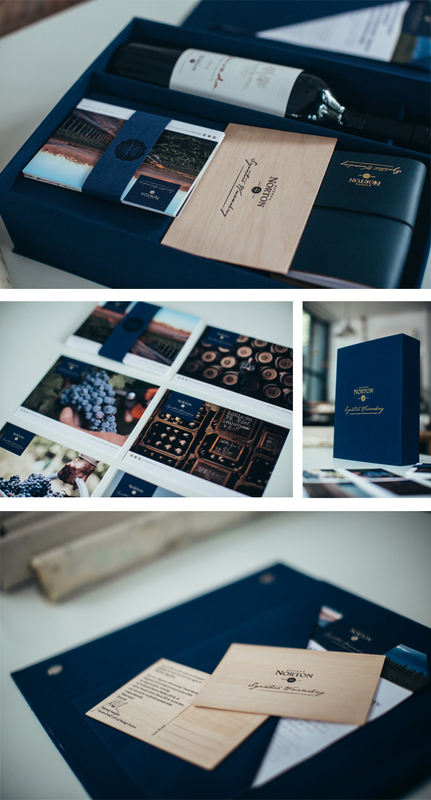 Every project, I take the challenge of telling a story by communicating its purpose through design and artisanal ways of printing. I believe life is an experience made of a small act, where the beauty of small details grounds us and turns each moment in a unique ritual. THE PRINTING BUG I took a class in Parsons, and my teacher was a typography designer and a letterpress printer. After several trips to his studio I was bit by the letterpress printing bug. 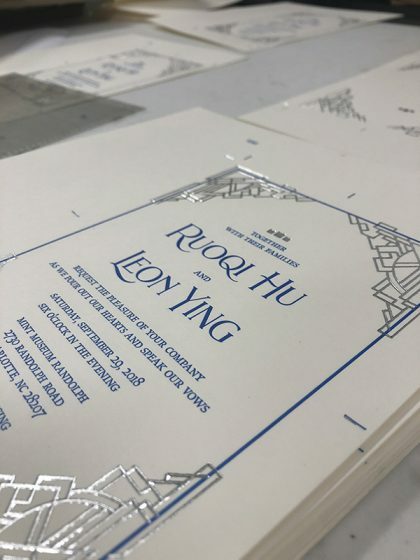 I fell in love with the technique of letterpress printing and how this could take printing to a higher level. MIAMI MARVELS I have a tiny studio, with more windows than walls, located on a sunny corner of Miami Ironside in a bucolic garden. When I first saw this space, I knew it was “the one,” due to all the natural light coming in during the afternoon, I felt this space was going to illuminate me. WIth the natural light and the abundance of windows … I feel like the garden is part of my studio. Behind the studio are train tracks, and several times a day, I can hear the train pass through. Next to the studio, is MiMo (AKA: Miami Modern) a neighborhood that is bringing to life the Art Deco hotels and restaurants of the great era of the Magic City! PRINTING INSPIRATION Although he probably doesn’t know this … my first inspiration was Peter Kruty, my professor at Parsons because he taught me how to respect typography. FULL TIME PRINTER I became a full-time printer in 2004 after I bought my first letterpress. THE CREATIVE PROCESS My creative process starts with a conversation with my clients, so I can understand the essence of the message. With each project, I design every aspect and incorporate elements and details of the message into their piece. I like to think of what will surprise me … because it will most likely surprise my audience, and will help keep it innovative and fun! PRESS HISTORY I still have my first press(!) which is a C&P Pilot press. BOXCAR’S ROLE When I find a good vendor, I stick to it! Throughout my years of printing, Boxcar Press has come to my rescue. Whenever I have a rush job, they are always availble to help and save me. There is a sense of loyalty to one another, and I feel they are a part of my team. PRINTING TIP When you don’t know something, ask your colleagues! And if they are not around, don’t be shy to experiment! SHOP TIP …Mmm, I don’t have any particular one, I just know that when it gets very frustrating and it doesn’t work out, I let it rest and start again a few hours later. WHAT’S NEXT I want to focus more on doing limited editions and special packaging. I also love to give back by sharing my passion and expertise with paper. This year I’m involved with missionaries in the desert of Peru who train people in disadvantaged communities on how to make handmade cotton paper. 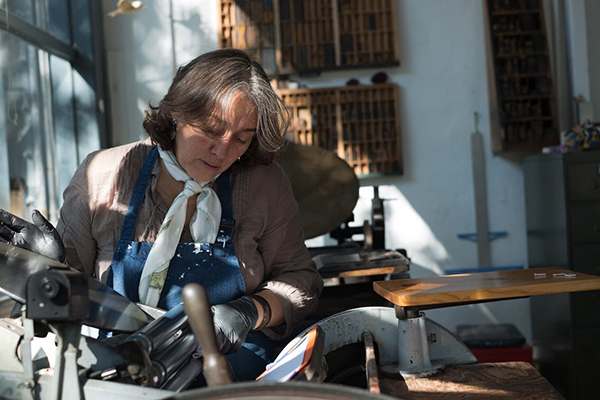 This wonderful community and its artisanal workshop, Papelera Don Bosco, has a letterpress machine, so I will be teaching them all I know about letterpress and box-making so they can fly high! An immense round of appreciative applause out to Catalina for letting us get a sneak peek at the magic behind Puro Papel!